Purpose: To train local village midwives and other community health workers in the safe delivery and care of infants. Description: In APECA’s service area of the District of Fernando Lores, babies are most often born at home, requiring the use of home birthing methods. APECA made the decision to address the need for training traditional midwives and health post technicians who can be available to some villagers. Although data is very difficult to collect in remote areas, the recorded incidence of maternal deaths during birthing has been significantly reduced. APECA continues to provide proper training, knowing that education provides the answer needed for these community volunteers who dedicate themselves to responding to their neighbors when needed. No one is closer to the new mother than is the midwife who assists in the delivery. They inspire confidence and trust. Trusted midwives in the community are better prepared to provide medical education. Trainers include doctors, nurses, and midwife professionals from Iquitos. Topics covered include reproductive health, sexually-transmitted infections, and the stages of pregnancy from conception to post-birth. Midwives are trained to prevent common reasons for maternal and neonatal mortality, and to coach the mother-to-be through her pregnancy, attend the birthing, and encourage the mother’s continuing contact with health services. New mothers can come to know how to prevent many of the illnesses that can endanger the lives of their children. 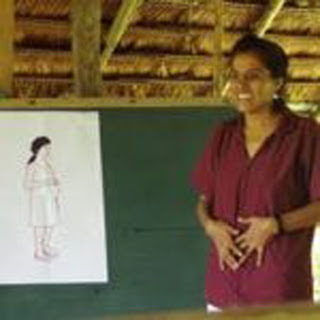 The Ministry of Health now provides training and educational materials for all midwives and other community health workers who come to APECA’s field center, El Fundo, for education. It is anticipated that the administration of other health projects will be improved by field liaisons who will record birth weights and measurements, and diagnose other problems that might otherwise go undetected.